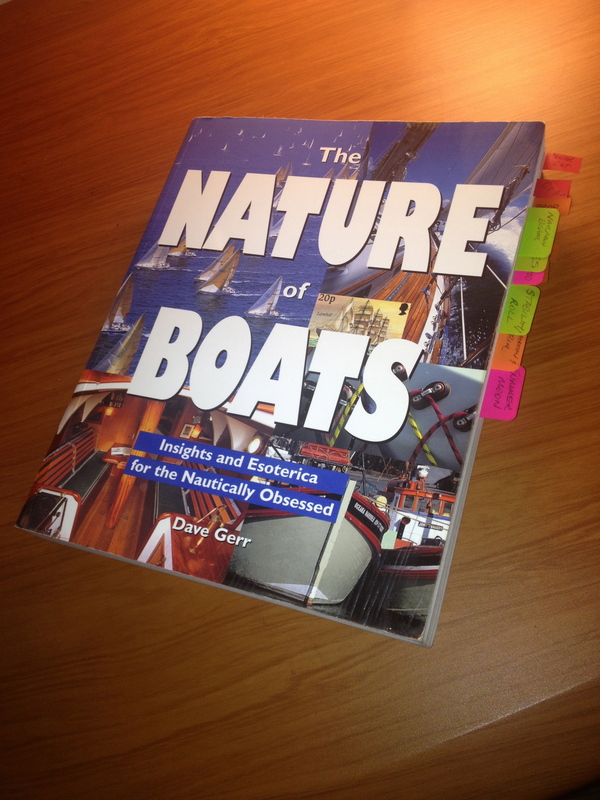 Book Review: The Nature of Boats by Dave Gerr – Howard Boat Works, Inc. If you are nautically obsessed, this book should be on your shelf. The photo above shows my copy which has more tape flags, notes and scribbles than any other book I’ve ever had. This is partly because I used to be an active student of the Westlawn Institute of Marine Technology, the only nationally accredited distance-learning school of small-craft design in the United States. I enrolled in their yacht design program in 2001. Surely, you may be thinking, 12 years later you must have completed the course. Sadly the answer is no. I got halfway through and stopped, but I have every intention of finishing the course when the time is right. Ok, so much for the mea culpa. The other reason why the book is so dog eared and tabbed is because it is so chock full of useful information that it’s an invaluable reference tool. The title is apt; the book explains, in detailed yet friendly and conversational fashion, how and why boats do what they do. Besides being a very talented naval architect and teacher, Dave also writes with disarming ease and an accomplished storyteller’s polish. Dave is not only ate up with boats, but he knows what makes them tick. Yes, there is math, but don’t be afraid. You don’t have to be an engineer to understand this stuff. If you made it through high school math, even if you were crappy at it, you’ll be fine. Just idle through and mosey. Go slow. Approach it like you approach a new dock in your boat, taking your time. What makes the book so good? What is a boat’s displacement and how can I figure it out on my own? How do I measure and understand stability? How can I interpret hull shapes so that I understand what the boat will be good at and not good at? How can I tell how fast a boat, either sail or power, will be? Dave sprinkles the book with short stories based on personal experience that help illustrate various elements of boat operation, care and feeding and troubleshooting. Best of all, the book is never stuffy or overbearing. Dave knows more about boats than an enormous percentage of the world’s population but he never acts or writes that way, and that might be the best part about the book. If you own a boat or like boats get a copy. Every time you open it up it’ll be like visiting an old friend. I agree with everything you said about Dave’s book. An excellent read. Easily understood and one heck of a good reference book. Mine looks about as dogeared and worn as yours. Cheers Peter and thanks for the note!